EduCase™ is a portal creating a global IMRT case archive and contouring training tool system. All IMRT cases published to ASTRO's EduCase portal are for the ASTRO community members to interact with and practice their contouring techniques. EduCase™ provides an easy-to-use graphical user interface that simplifies the management and publishing of large volumes of IMRT cases including CT, PET, MR, US and 4D respiratory. EduCase™ is used by organizations of all sizes for posting of IMRT cases, Private Intranets, and Extranets and is supported by a community of thousands of users. EduCase™ website and desktop application allows for the customization on every aspect of a Case archiving, Clinical Trail management and Medical Residency Training capabilities for the Radiation Oncology community. EduCase™ has a rich heritage in education and has been crowned the online contouring king many times over. Now with more power under the hood, EduCase™ is shifting gears and provides the Radiation Oncology community the power to train students while making the user experience all the more friendly. For those who always wanted increased extensibility of their Rad Onc training, EduCase™ can make this happen. 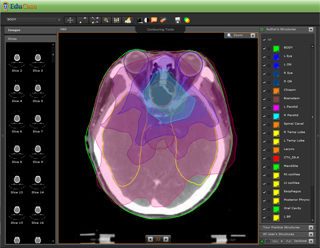 The ASTRO EduCase™ website allows for customized Case archiving, contouring for Clinical Trail management, and Medical Residency Training for the Radiation Oncology community. Using Adobe Flex framework, Amazon WebServices, and the ubiquitous Adobe Flash Player plugin, our development team brings the excitement of 'the next generation Contouring Tool' to your fingertips. Whether you are connected to the internet, offline in an airplane, a Radiation Oncologist, a Residency student, a Physicist, a Dosimetrist, a Radiation Therapist or a Radiologist, EduCase™ can take you to the next level of online IMRT case delivery, training and collaboration. Thinking Complete IMRT Case Communications? Think EduCase™!